Green is one of those colours that people either love or loathe. My school uniform was bottle green! - but despite that I'm enjoying seeing so many shades available - from rich emerald tones to delicate mint, cool teals to fresh lime. So which is the right green for your colouring? It could be that you don’t like it on you because you haven’t tried the right shade yet. Here are the six dominant colour types and a great green for each. 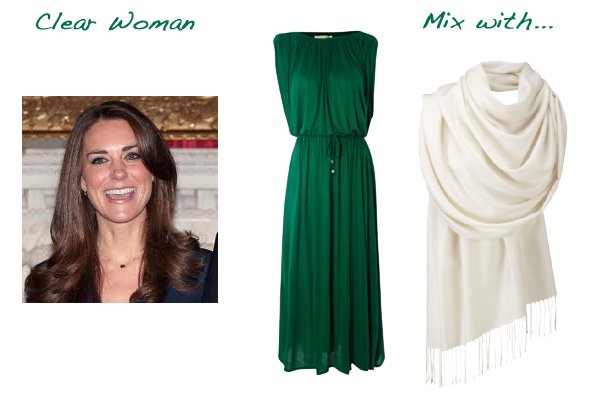 I’ve shown a scarf beside each (just as a colour swatch) to give you an idea of a colour to mix with your green. For light colouring, try a fresh apple, or mint green with taupe or light navy. Deeps can go for forest green or emerald, combined with purple or a true red for a rich combination. 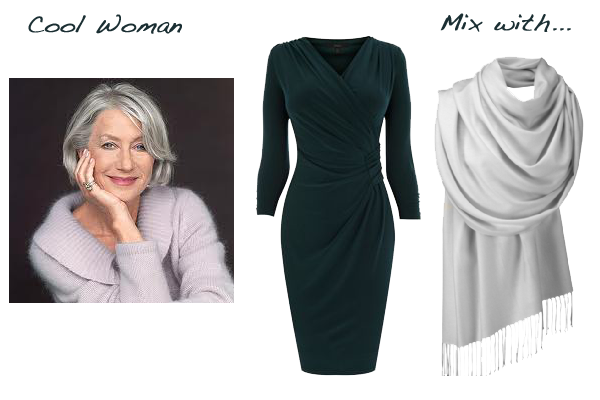 The Cool woman can wear a blue green, teal or aqua - stunning with silver grey or charcoal. Warm tones look good in lime, olive or emerald turquoise - depending on how bright or muted your colouring is. Mix with chocolate, bronze or pewter. Softs look gorgeous in jade or sage green, blended with natural beige, pewter or cocoa. Create contrast for Clears with evergreen and soft white, shown here - or a bright apple green with charcoal. So give green a go and who knows - try it and you might like it!